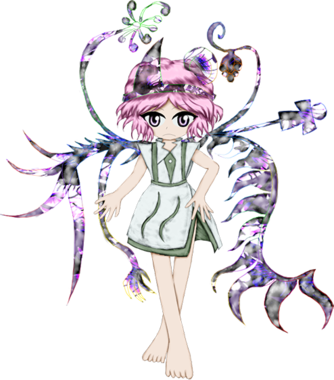 Shion (シオン) is a chimera soul born from the soul-eater flower Harujion.﻿ They were officially adopted into the Senri Shrine. Shion is the final boss of Reactivate Majestical Imperial and a playable character in Brilliant Pagoda or Haze Castle, as well as a possible final boss. Their origin involved the Harujion, a flower from the Outside World that rarely blooms in Mugenri. The few times it appears in Mugenri, only one flower blooms and it needs to absorb the vital energy from all living beings around it to be able to grow up. The flower can be used to create drugs, resurrect the dead or achieve immortality. To prevent this, it is the duty of someone from the Senri Shrine to lumber its sprout down. Unfortunately, since the priest Tsurubami Senri was currently on holiday in the Outside World and forgot to warn Yabusame Houlen and Tsubakura Enraku about this, the Harujion blooms once again without anyone to stop it. The place where the Harujion sprouts this time was the same place where Taira no Fumikado was planning to do their resurrection ceremony. Without Fumikado's knowledge, a great amount of souls that they were collecting were absorbed by the flower. Then a great number of dead and alive beings from there were mixed generating a single personality. Even being a spirit, since it possessed much more vital energy than a normal creature, it had also a physical body, thus Shion was born. Shion is a cheerful and energetic newborn youkai. They are very interested about souls and the aura of others, and judges people's personality based on that (for example, they see that Adagumo no Saragimaru has a green aura, making them straightforward and dutiful; while Kuroji Shitodo has a black disgusting aura). However, they are somewhat mature and because they are a composite of spirits, they have a vast amount of knowledge and experience, sense of values and preconceptions, purity and wickedness. This is the ability that enables them to manipulate ghosts and spirits, an ability they possess because they were born from the Harujion, the flower that feeds from spirits. As show in-game, Shion can absorb spirits and use them as life source. Shion can use their ability to great lengths. For example, they can understand the soul (heart) of a person based on smell and knows when someone tells lies. Shion also has a pair of ghost-like entities called Id and Es. 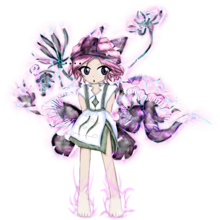 Their character may be an homage to Yuyuko Saigyouji , because both are final bosses, have similar colour palettes, have carefree personalities and wish to revive a plant that absorbs spirits, which provoked a long winter. They're also gluttonous and despite their ditzy tendencies, also sometimes display an extraordinary level of knowledge. Their known name is Shion (シオン) because they had no name when they were born. Thus, Yabusame Houlen gave them the name "Shion" which is derived from "harujion", the Japanese name for the Philadelphia fleabane plant. According to JynX, "Shion" is written as "死宛" in Chinese, which is a phonetic translation of Shion. 死 means "to die" or "inactive", while 宛 means "as if" or "crooked", and can act as a surname. Shion is short in height, shorter than Sukune Katano as shown in the endings, and has pink hair and eyes. They're barefooted and wears a purple hitaikakushi and a sleeveless white haori. According to JynX, the projections coming out of Shion's back are souls, and the fact that they take on the forms of insects and plants show that Shion is more than an aggregate if human souls, but the souls of other creatures as well. In Reactivate Majestical Imperial, because the Harujion flower sprouted in a grove next to Taira no Fumikado's resurrection ceremony, it absorbed all the spirits and because of the influence of the Mugenri Barrier, most of them were evil and vengeful spirits. Thus, a new youkai was born, and after developing a personality, they continue to recollects spirits for the Harujion to bloom, resulting in the long winter and the increasing number of ghosts. ﻿Yabusame Houlen and Tsubakura Enraku reach the Withered Grove. They only find the Harujion, so Tsubakura asks aloud if someone else is there. When they receive no answer, they try to go away only to be stopped by Shion. Realizing that this is a newborn youkai, Yabusame names them Shion, based on the Harujion's name. Shion can sense people's minds by smelling them, and is particularly interested in Tsubakura because of their blank, neutral soul, wanting to consume it. Realizing that the Harujion was causing the long winter, the heroes fight Shion in a danmaku duel. In the end, Yabusame and Tsubakura return to the Senri Shrine, bringing Shion with them, much to Jinbei's chagrin. Shion eats some of Tsubakura's soul (lifespan), but they don't care much about it and brushes off Jinbei's concerns. Adagumo no Yaorochi and Sukune Katano reach the Withered Grove, where they find a tiny newborn youkai sleeping next to a mysterious big flower. They wake up upon sensing them and comments about the smell of their souls, but Sukune misunderstood it and gets offended. Yaorochi demans Shion to introduce themself, which they do, saying that they were born from the Harujion and the massive amount of spirits it consumed. Yaorochi and Sukune realize that this happened because Yabusame and Tsubakura were not told to uproot the Harujion, a task that Tsurubami Senri did while still in Mugenri. Shion expresses interest in eating Yaorochi's soul and they fight. In the end, Yaorochi and Sukune return to the Senri Shrine, with Shion following them. Shion declares that they are interested in the essence of the shrine and stays there. Kuroji Shitodo and Adagumo no Saragimaru reach the Withered Grove, where they find a sleeping Shion. They are discussing if to attack the sleeping youkai or not, but Shion wakes up anyway. Shion smells their souls and calls Saragimaru's hard-working and Kuroji's disgusting. Kuroji is more interested about the Harujion and decides to cut it in order to sell it for a large sum of money. Shion does not allow them to do that, and both fight. In the end, Kuroji and Saragimaru return to the Senri Shrine, with Shion following them. Shion declares that they are interested in the essence of the shrine and stays there. After the events of Reactivate Majestical Imperial, Shion was sealed into the Senri Shrine by Jinbei. Kuroji tells Tsubakura and Yabusame about rome rumours of "The Heaven divides the mirror". Tsubakura mistakes the terms and believes it will rain sake, so they go with Yabusame on a quest to get free sake. Jinbei, sensing an incident, frees Shion from their seal in order to assist Tsubakura and Yabusame. Shion is more interested in consuming the souls of the opponents they came across, though. Generally, Shion is on friendly terms with Yabusame Houlen and Tsubakura Enraku. Shion becomes very attached to Tsubakura, after noticing that they have a neutral soul and wants to consume it. Tsubakura dislikes Shion's clingy and childish attitude and considers them an annoyance, much like Yabusame. Yabusame was the one who gave them a name and both get along because they have a similar ditzy personality, although they still get annoyed at how Shion butts in their conversations and clinginess towards Tsubakura. Illustration of Shion with Yabusame and Tsubakura for Len'en Project's 3rd anniversary.